Mercedes-Benz and its group companies Mercedes-Benz India (MBIL), Daimler India Commercial Vehicles (DICV), Mercedes-Benz Research and Development India (MBRDI) and Daimler Financial Services India (DFS) inaugurated Safe Roads in Hyderabad, as part of its multi-city awareness roadshow series that started in Kochi this year. 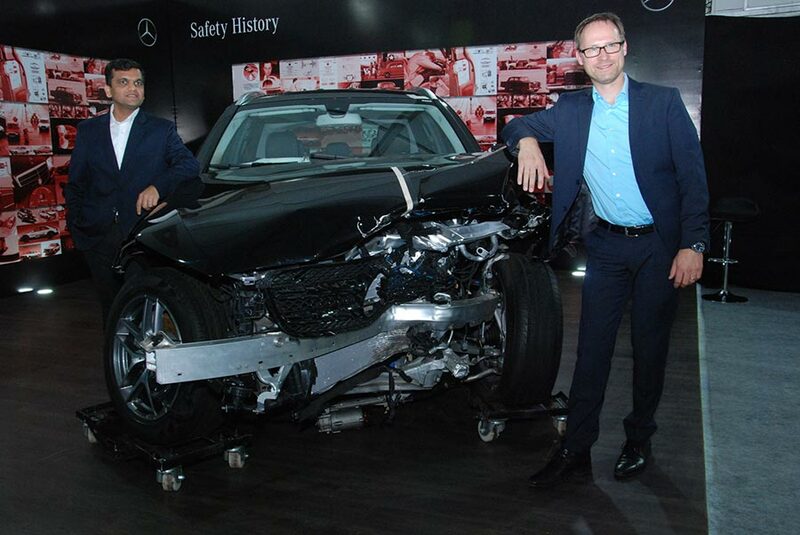 Safety is a core competency and a core value for Mercedes-Benz and its automotive brands. Mercedes-Benz in particular, is renowned worldwide for developing highly sophisticated safety systems. However, implementation of effective safety systems remains a challenge, as the road users often do not comply with traffic rules or do not use the safety systems onboard their vehicles. On Indian roads, approximately 140,000 people die every year of road accidents, largely caused due to ignorance of safety norms and rules. 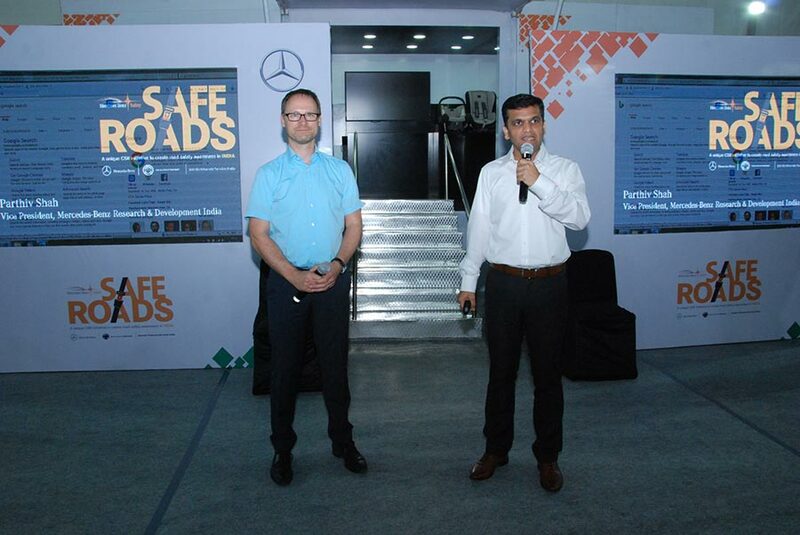 ‘Safe Roads’ was hence conceptualized by Mercedes-Benz, in an effort to reduce this startling fatality rate on Indian roads, by creating more awareness on road safety. 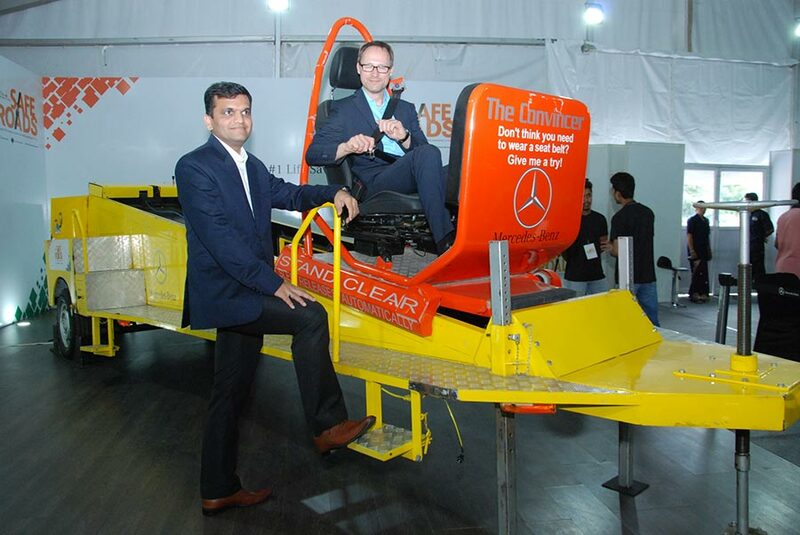 Mercedes-Benz is convinced that such initiatives can begin an era of road safety awareness that supports a new culture of road safety for Indians. Over 70 per cent of the fatalities can be reduced in the next ten years through education and enforcement of safety rules and by creating awareness. The roadshow was held at the Forum Sujana mall on 1st and 2nd October for public participation and will be at the Jawaharlal Nehru Technological University on 5th and 6th of October to orient students on road safety awareness. The most popular exhibit remains the Belt-Slide which enables visitors to experience the impact of seat belts in a simulated crash environment at low speed. The aim is to increase the percentage of seat belts usage for front row passengers including driver. The Mercedes-Benz PRE-SAFE® Seat system: Enables visitors to experience the PRE- SAFE® features of the Seat. Using a network of sensors, PRE-SAFE® system can detect certain conditions that suggest an accident is about to occur. The PRE-SAFE® seat system then pre-tensions the front seat belts, adjusts the front head restraints and passenger seat to better prepare the occupants for more effective results from the restraint systems. An absolute highlight is the Mercedes-Benz S-Class S500. 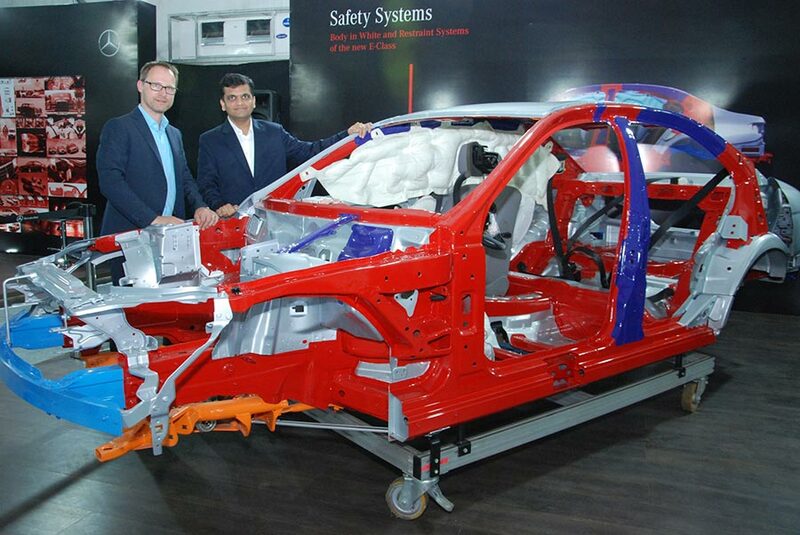 The S-class will be on display to showcase a glimpse of future of safety. The S-class illustrates trailblazing innovations in the field of active and passive safety. A ‘Body in White’ (BiW) passenger car exhibit highlights some of the core elements of a car structure which have high tensile strength that can absorb most of the energy during a crash and minimize passenger car intrusions. Alcohol goggles provides a unique experience: Wearing these special types of glasses simulates the common ‘walk-the-line’ activity which causes loss of balance and delayed reaction times. Visitors will feel their susceptibility to impairments and realize the potential severe consequences due to alcohol consumption. As per Ministry of Road Transport & Highway, India (MORTH) 2015 report, India is a signatory to Brasilia Declaration and is committed to reduce the number of road accidents and fatalities by 50 per cent by 2020. However, with one of the highest motorization growth rate in the world accompanied by rapid expansion in road network and urbanization over the years, our country is faced with serious impacts on road safety levels. The total number of road accidents increased by 2.5 per cent from 4,89,400 in 2014 to 5,01,423 in 2015. The total number of persons killed in road accidents increased by 4.6 per cent from 1,39,671 in 2014 to 1,46,133 in 2015. Road accident injuries have also increased by 1.4 per cent from 4,93,474 in 2014 to 5,00,279 in 2015. The severity of road accidents, measured in terms of number of persons killed per 100 accidents has increased from 28.5 in 2014 to 29.1 in 2015. The analysis of road accident data 2015 reveals that about 1,374 accidents and 400 deaths take place every day on Indian roads which further translates into 57 accidents and loss of 17 lives on an average every hour in our country. About 54.1 per cent of all persons killed in road accidents are in the 15 – 34 years age group during the year 2015. During 2015, thirteen top States namely Tamil Nadu (69,059), Maharashtra (63,805), Madhya Pradesh (54,947), Karnataka (44,011), Kerala (39,014), Uttar Pradesh (32,385), Andhra Pradesh (24,258), Rajasthan (24,072), Gujarat (23,183), Telangana (21,252), Chhattisgarh (14,446), West Bengal (13,208) and Haryana (11,174) together accounted for 86.7 per cent ofall road accidents in the country. In Hyderabad alone, (from 2015 up to May 2016) there have been around 3488 reported accident cases and around 553 fatalities. A major stake of these casualties could be accounted to the careless stance that motorists take on the roads. Driver’s fault has been revealed as the single most responsible factor for road accidents, killings and injuries on all roads in the country over a long period of time. Drivers’ fault accounted for 77.1 per cent of total road accidents during 2015 as against 78.8 per cent during 2014. Within the category of drivers’ fault, road accidents caused and persons killed due to exceeding lawful speed/over speeding by drivers accounted for a share of 62.2 per cent (2,40,463 out of 3,86,481 accidents) and 61.0 per cent (64,633 out of 1,06,021 deaths) respectively. Technology, Innovation and Research go hand-in-hand in improving vehicle safety. With the Safe Roads initiative, we have brought in a new era of safety awareness keeping the Indian road scenario in focus. Accidents and resulting fatalities can not only be greatly reduced through innovative technologies but also through responsible driver and passenger behavior. Mercedes- Benz has developed state-of-the-art safety features that have proven to be effective. In MBRDI alone, there are over 100 engineers contributing to these technologies in active and passive safety of Mercedes-Benz vehicles with 54 patents filed on automotive safety. While there are some policy and regulatory hurdles that exist in order to apply them in India, we hope that the ‘Safe Roads’ initiative will enhance the road user’s awareness of such technologies and will help persuading the legislators to ease these norms for the greater good of society. Following the successful event we had at Hyderabad, the Safe Roads initiative will be travelling to Kolkata soon! Mercedes-Benz India Ltd. (MBIL) in Pune is responsible for production and sales and marketing of Mercedes-Benz passenger cars. Daimler India Commercial Vehicles (DICV) produces medium and heavy duty trucks under the brand name Bharat Benz in Chennai, covering all activities for commercial vehicles. Daimler Financial Services (DFS) for passenger cars and Bharat Benz Financial Services for commercial vehicles. Mercedes-Benz Research and Development India Private Limited (MBRDI) in Bangalore is the largest Daimler Research and Development Centre of Mercedes-Benz outside Germany.